Mini facelifts are intended for people who have a small to moderate amount of loose skin and wish obtain a refreshed look through plastic surgery. Dr. Kearney makes the incision inside and around the ear and into the hairline. The length of this incision is minimized and tailored to every patient and is a shorter incision than a standard facelift. Excess skin and tissue are pulled back and removed and once healed the incisions are hardly noticeable. Sometimes the underlying muscle is addressed but not always. 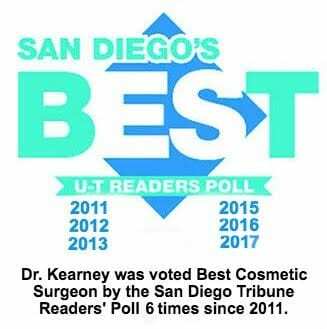 Dr. Kearney performs mini or limited facelifts under local anesthesia with light sedation or general anesthesia if you prefer. You may go home the same day. Patients usually return to work within 1 week following the procedure and can resume normal activity within 3-4 weeks. Most bruising and swelling is gone within 7-10 days. A mini or limited incision facelift can be performed in conjunction with a neck lift. For more information on facelifts, call our office at (800)-671-1951.